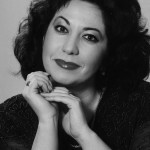 Elena Zelenskaya was born in Baku and graduated from the Baku State Conservatoire going on to become soloist with the Baku Opera and Ballet Theatre Company. She went on to win Second Prize at the Glinka Vocal Competition and First Prize at the Rimsky-Korsakov International Competition in St. Petersburg. Soon after, she joined the company of the Moscow New Opera, with which she made her Italian debut as Gorislava RUSSLAN AND LUDMILA. After her successful debut with the Bolshoi Opera in the title role of TOSCA, Elena Zelenskaya immediately became a principal artist, appearing in many opening nights of new productions. Among her roles with the company are Amelia UN BALLO IN MASCHERA, Lisa PIQUE DAME, Countess Almaviva LE NOZZE DI FIGARO and the title role in AIDA. In addition, she has appeared as Tatiana EUGENE ONEGIN, Mimi LA BOHEME, Santuzza CAVALLERIA RUSTICANA, Nedda I PAGLIACCI, Queen Elizabeth MARIA STUARDA, Leonora LA FORZA DEL DESTINO, Leonora IL TROVATORE, Yaroslavna PRINZ IGOR and the title role in LA WALLY. Elena Zelenskaya has appeared regularly at the Mozart Festival at Schonbrunn, Vienna and performed Gorislava RUSSLAN AND LUDMILA with the Moscow New Opera at Carnegie Hall, New York as part of the company’s tour of the U.S.A. She has also been a regular guest at the Wexford Festival, where her highlights include Giordano SIBERIA. On the concert platform she has appeared with the Los Angeles Philharmonic Orchestra in Britten War Requiem, conducted by Antonio Pappano, and the San Diego Symphony with Verdi Requiem. She has sung Lady Macbeth MACBETH in Luzerne and appeared with great success as Leonora LA FORZA DEL DESTINO at the 1998 Savonlinna Opera Festival in Finland. Other engagements included the title role of AIDA for both the Deutsche Oper am Rhein in Düsseldorf and for the Deutsche Oper Berlin; performances in the title role of TOSCA with the Bergen Philharmonic under János Fürst; Lady Macbeth MACBETH for Minnesota Opera; LA FORZA DEL DESTINO for the Royal Opera in Copenhagen; the title role of TOSCA for La Monnaie in Brussels; Lady Macbeth in a new production of Verdi MACBETH, Maddalena ANDREA CHENIER, AbigailleNABUCCO and Odabella ATTILA all for the New Israeli Opera in Tel-Aviv; and the title role of AIDA for both San Diego Opera and the Savonlinna Festival. She also made her debut for the Gran Teatre del Liceu in Barcelona as Mimi LA BOHEME, Lady Macbeth MACBETH for Oper Köln and sang Amelia UN BALLO IN MASCHERA for the Riga Opera Festival, a role in which she made her Metropolitan Opera debut in 2001. Most recently, she made her Italian debut with Teatro La Fenice di Venezia at the Palafenice in the role of Odabella ATTILA. She also sang Abigaille NABUCCO in Athens and appeared in the title role of TOSCA for Scottish Opera. Additional appearances include Elisabetta de Valois DON CARLO for Oper Köln, Lady Macbeth MACBETH for Seattle Opera and Leonora LA FORZA DEL DESTINO for the Metropolitan Opera in New York.